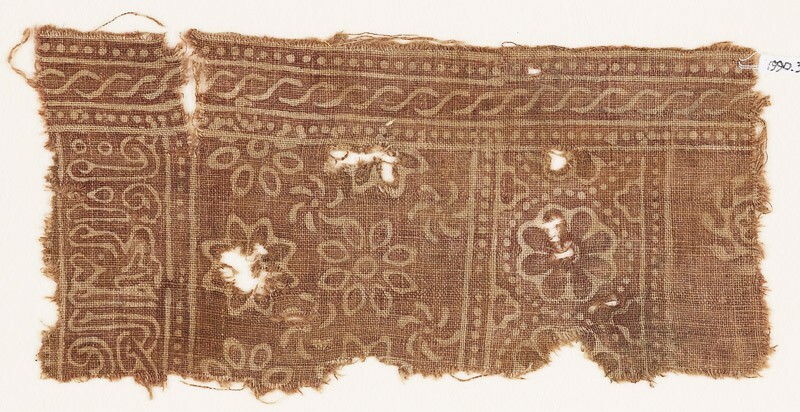 Bands of different width, all with a beaded border; eight-petalled rosettes, red against light and set in a circle of dots, two types of smaller rosettes and spirals in a wider band and loosely arranged, a band of script, and a cable pattern at right angles to the other bands. The reverse is almost completely saturated with dye. The inscription reads 'perpetuity and good luck. Glory and...'; it derives from Ayyubid or early Mamluk script (c. 1200-1260). The textile may therefore have a mid-13th-century date.